Do you believe in miraculous healings? When his doctors told him he was going to die, the first thing I said to my friend Jordan Young was, “With love, all things can be healed.” The cancer, which started in his lymph system, had by this point choked his lungs with dozens of tumors that spread out in a stranglehold of death. He was just a kid — eighteen. In our world, sickness seems like the natural course of the body, but it doesn’t have to be. It may be hard to believe, but health is actually the body’s natural state. It is sickness that is unnatural. In order to heal or remain healthy, you don’t really need to do anything. Without interference, your body will automatically settle into a state of balance and wellness. When you become ill, what you really need to figure out is what has gone wrong. Jordan and I learned many powerful, life-changing lessons during our journey together. I’d like to share a few of these with you now. Lesson 1: The body and mind are not separate. All authentic, lasting healing begins with understanding this premise. In fact, the body and mind are so intricately linked that where one ends and the other begins is something even science cannot unravel. Your mind has a tremendous impact on your physical state. When you become ill there is almost always some reflection of that illness in the mind. So if you can discover the corresponding psychological element to a physical disease — and fix it — the physical part will heal itself. Perhaps this healing will happen spontaneously, but even if it doesn’t, some effective treatment will come into play: a treatment will be discovered; the perfect healer will appear at the perfect moment; the right medication will be found. Lesson 2: Every thought has an impact on the body. Consider that the average person thinks some 60,000 thoughts every day. Your inner dialogue is a virtually unbroken stream of self-talk, and it has an enormous impact on how you feel, both physically and emotionally. Everything you think has an energetic charge to it, like electricity, that cannot be held apart from your body. Every thought either heals and balances the body or opens it to disease. Lesson 3: In order to heal, the patient must believe healing is possible; the patient must want to heal; and the patient must feel they deserve to heal. Unless the above three conditions are fully met, no treatment or medication will ultimately be successful, because the patient will be fighting his or her own beliefs and desires. How can a patient truly heal if they don’t want to, don’t think they deserve to, or cannot even conceive of healing being possible? It is essential, then, that a patient uncover every hidden doubt about healing and urge to be ill; otherwise, the seeds of the disease will remain. Jordan and I worked together on these lessons, and other lessons of love and healing, for months. I am not claiming that Jordan’s healing was miraculous. Many physical treatments came into play. But, however it came about, Jordan did, remarkably, find himself at just the right hospital at just the right time, where just the right healer appeared at just the right moment. And the right medication was found, just when all hope seemed lost. One bizarre coincidence led to another, and that’s how Jordan became “that guy” — you know the one: the guy who survived a terminal diagnosis. The following visualization is a healing exercise I taught Jordan. It isn’t meant to replace traditional medical care, but it makes a powerful supplement to modern treatments. Even if you aren’t sick, it is a great way to quiet your mind and balance your body. Practice it for ten to fifteen minutes once or twice a day. 1. Find a quiet place, sit down, close your eyes, and relax. 3. Now picture the light growing a little brighter each time you breathe in, increasing in intensity. Then, as you exhale, see it flowing from your chest through the rest of your body, all the way to the tips of your toes and fingers and the crown of your head. Repeat this visualization with every respiratory cycle: breathing in, the light grows brighter; breathing out, it flows through your body. 4. Imagine that this light is healing every function, organ, and cell in your body as it passes. Try not to think of it as destroying the disease so much as repairing and rebalancing. 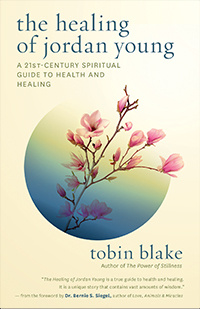 Tobin Blake, the author of The Healing of Jordan Young, The Power of Stillness and Everyday Meditation, is a longtime student of meditation, healing, and the mind-body connection. He holds workshops on meditation and spiritual awakening and lives near Bend, Oregon. His website is www.tobinblake.com. Based on the book The Healing of Jordan Young: A 21st-Century Spiritual Guide to Health and Healing. Copyright © 2015 by Tobin Blake.